This smart air freshener is like a Keurig for scents, making it easy for users to customize their own aromas with their smartphones. Scent is one of the strongest senses in the human body, yet even in today’s era of smart devices, the best way to control odors is through plug-in air fresheners or sprays. Moodo is a smart fragrance machine which provides users with complete control over how their environment feels and smells. To set itself apart from traditional diffusers the system has four slots for which scent pods can be inserted. From there, users can use the companion mobile app to customize and create their personal scent levels and combinations. To use the device the user inserts their four fragrance capsules to be mixed and diffused. They then connect their phones and then use the companion app to set the desired scents. The device uses a rechargeable battery so there’s no outlet required and it supports wireless connectivity so that users can take Moodo wherever they want. A few of the scents included with the system include Orange Sunrise, Grandma Vanilla, Midnight Thrill, Precious Spices, Divine Rose, Sandal Wood, and Spice Bouquet. The companion Android and iOS mobile apps enable users to customize the levels of each scent, manage their favorites, browse pre-made scent combinations, and also set the schedule of their scents. Some recipes of the device include Fresh Vibrations, Gardens of Isfahan, Cozzzy, Oriental Delights, Beach Party, Ashram Spa, and Mediterranean Dreams. There’s also built-in social media integration so users can easily share their favorite combinations. 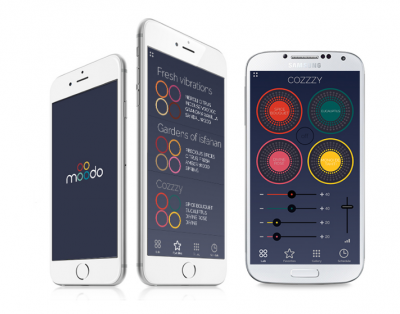 In addition to these features, Moodo also supports numerous integrations so users can connect the device with alarm clocks, email applications, and more to trigger scents whenever it works best with them. According to Yoav Avidor, CEO of Agan Aroma, the product came about when he was on vacation with the founder of a company that made toolbars for Google. During his trip, he had the idea of creating a Nespresso type capsule-based perfume machine. When he went home, he began the research and development process to survey the markets and identify its needs. Moodo is 4.8 in x 4 in. The scent capsules are 1.9 in by 1.2 in. It also has a built-in rechargeable battery along with connections for WiFi and Bluetooth. The device’s rechargeable batteries (built to work with standard outlets) are designed to last seven hours per charge and scent families (four capsules) last about two months in daily use. So far the makers of Moodo have raised over $40,000 towards their $50,000 goal via Indiegogo. The early bird starter pack sells for $149 and includes a Moodo Box and two sets (eight individual) of fragrance capsules. The estimated shipping date is July 2017. I really hope this company does what it can to get as many aromas as possible to the consumers. Just like candles, that seems to be the limit all the time. This is awesome! I wonder if the scents could outlast that of a good, soy based candle? I would love to mix up my own scents in a way that candles do not allow you to. Built in rechargeable battery, Wi-Fi and Bluetooth is pretty awesome! I think that is a major game changer for a product like this. I am thinking this price point is a little high for something like this. I was expecting maybe $99. however, having the customizing options is pretty awesome!